Swiftwater Rescue Team Activated During Flash Flooding. Chester County has once again been inundated with heavy rains today. Multiple water rescues have been ongoing throughout the County. Around 8:45 am, Squad and Boat 53-2 were dispatched to Goshen Road and Plumsock Road in Willistown Township to assist Delco Station 41 with a vehicle submerged in water. The vehicle was found unoccupied. They were then assigned to evacuate an elderly couple from a house that was taking on water. 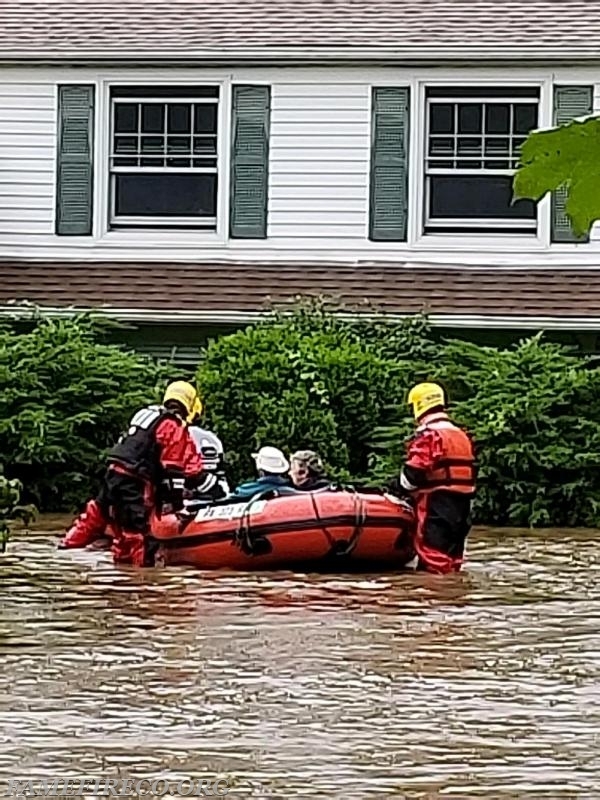 Pictured below is Boat 53-2’s Crew evacuating the residents from a house in Willistown Township. This was just one of numerous water rescue calls in the Tredyffrin/Main Line area. Squad 53 and Boat 53-2 were later relocated to the Valley Forge Middle School in Station 2’s (Berwyn) local to stand by and prepare to assist with rescues in the Tredyffrin/Wayne area. While this swiftwater team was deployed, additional swiftwater crews were standing by on station to provide services wherever they may be needed. After a very busy few hours, Squad 53 and Boat 53-2 safely returned to station. Crews decontaminated their equipment and prepared to respond at a moments notice! “With Willing Hearts, We Hasten To Assist”! Boat 53-2 crew safely removes occupants from flooded dwelling in Willistown Township.